The number of treatment options for androgenetic alopecia has increased during the last years. One of the newest is the mesotherapy with dutasteride. What is mesotherapy with dutasteride? It is a local treatment to stop and improve androgenetic alopecia. It consists of microinjections with antiandrogen drugs on the scalp to reach the hair root directly. Dutasteride is the most used drug in this therapy, due to its higher long-term efficacy. The use of this drug is off-label and several clinical studies have demonstrated its effectiveness. Before and after treatment with mesotherapy with dutasteride. 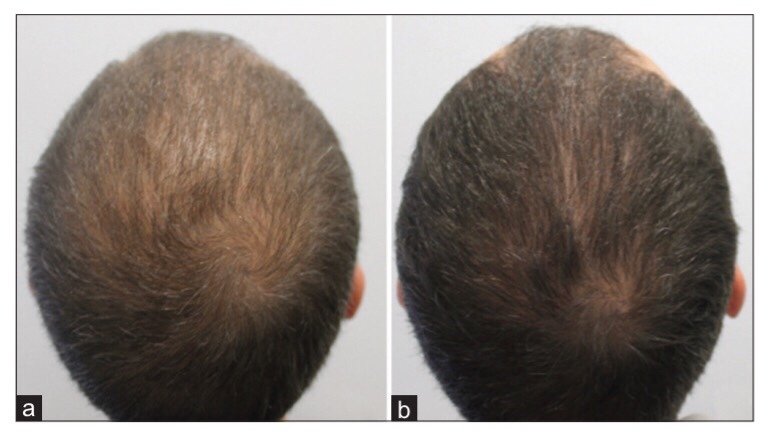 Image from International Journal of Trichology. An experienced dermatologist has to assess if the patient is a good candidate for this treatment. Patients will not need any special preparation before the procedure. First, local anesthesia is performed on the frontal hairline with a few injections, enough to anesthetize the area to be treated. Once this is done, the patient will be comfortable during the procedure and the doctor will be able to perform it properly. After that, the microinjections will be done along the area of alopecia (frontotemporal region, crown, etc) delivering small portions of the antiandrogen drug. Last, the scalp is cleaned up and the patient can continue with their daily routine. The whole treatment takes 20-30 minutes. The hair can be washed up the same day or later. Topical treatments, as minoxidil, should not be applied 24 hours after the treatment. Mesotherapy with duasteride on the scalp delivers high concentrations of the drug next to the hair root. This approach allows for the reduction of oral medication with finasteride or dutasteride. Scientific studies of mesotherapy with dutasteride have no traces of the medication in blood tests, and serum hormonal changes are exceptionally (actually, the published studies do not detect any changes in sexual hormones levels). The use of dutasteride has another advantage: its elimination from the body takes approximately 3 months, so we do not need to repeat the microinjections before that period of time. 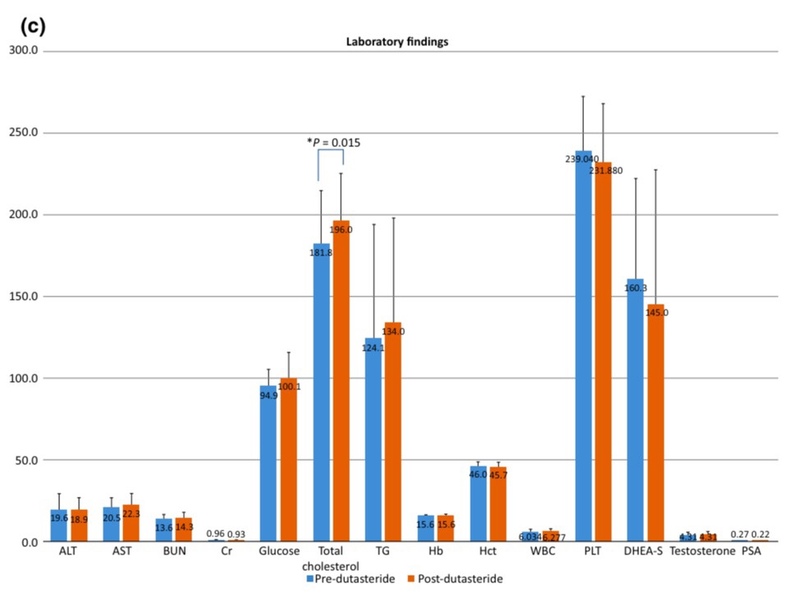 Changes in blood test before and after mesotherapy with dutasteride. No relevant changes are observed. Image from Journal of Dermatology. Click to enlarge. How often is the treatment performed? Frequency of the treatment depends on the patient, grade and type of alopecia, use of more therapies (oral, topical) and final target. It is not the same trying to improve hair density in areas of alopecia or stopping hair loss without improvement. Usually a treatment every 3 months is recommended as an intensive therapy to improve alopecia. As a therapy to maintain hair density, mesotherapy can be done just twice or three times a year. 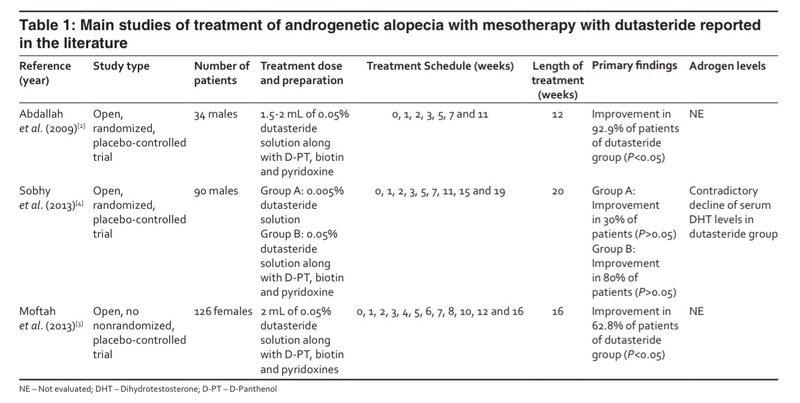 Scientific studies published of mesotherapy with antiandrogen drugs for hair loss. More than 200 cases described, men and women. Click to enlarge. May any side effects occur? After the procedure, the patient could notice a sensitive area on the scalp. Two or four hours after the local anesthesia is applied, they might feel mild pain that can be stopped with oral analgesics. However, not feeling pain is the norm. Local inflammation is very rare, when it appears is mild and painless. It is related to the volume of liquid injected and it disappears after 24-48h. Side effects related to antiandrogen drugs (like with oral finasteride or dutasteride) have not been detected, as the medication remains on the scalp.